It was the first period of a December 1993 game at The world's most famous arena, 7th ave and 33rd New York City, home of a fan base desperate for Lord Stanley to grace them with his presence for the first time in over half a century, when a highly gifted young man just shy of his 21st birthday took another long shift. He hailed from the other side of the pond (Togliatti, Russia to be exact, long ways away from Brighton Beach) and barely had a grasp on this land's native tongue but had a keen understanding of the international language: hockey. Or so he thought. For on this night as he glided on the hallowed Madison Square Garden ice about midway through the opening frame, blissfully unaware that his efforts and young legs were robbing ice time from a grizzled veteran, former NHL all star and assistant team captain Steve Larmer. The exuberant Alexei Kovalev finally came to the Rangers' bench for a change. To his surprise, head coach "Iron Mike" Keenan instructed the winger to remain on the ice. Keenan, long known to be a dictator of sorts (to put it mildly) in command of his team, had grown tired of the european sophomore's penchant for overextending his allotment of time on ice. Initially however, Kovalev was overjoyed to be, as he assumed "rewarded" with extra playing time. He was but a young man with superlative skill that warranted General Manager Neil Smith to use the 15th overall pick in the 1991 NHL Entry Draft to make a piece of history: Kovalev was the highest selected Russian player to date and the first to hear his name called by a big league club in the first round. Blueshift Faithful would often be dazzled and awed by Alex's dangles and sometimes speed, yet also bemoan him for not playing to his ability at all times. As the infamous shift dragged on, Kovalev would continue to come to the bench for a change, yet Keenan had instructed his troops to block his attempts from climbing over the boards and would only switch out 2 forwards to compliment Alex on the ice. It was becoming apparent that this was the crescendo of weeks of upon weeks which saw the young Russian's shifts extend beyond a standard 45 seconds in the wake of burgeoning frustration by his mates. A tough love statement from a coach with championship aspirations on a veteran-laden club. An exercise akin to that of your old-school father forcing a whole pack of cigarettes down your throat when he found your pack of Marlboros. This excursion of a shift was capped off when a visibly exhausted Kovalev ended it in his own fashion of carrying the puck through 5 opponents for a dazzling highlight goal. 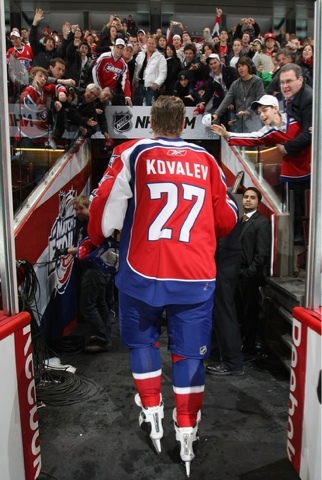 As such was Alex Kovalev. Often regarded as an enigma wrapped in a mystery, he was one whom was misunderstood as often as perhaps he misunderstood the philosophy of dump-and-chase. Two things were evident though right to the end of his NHL career, which officially came to a close as a member of the Florida Panthers last week; he had more skill than any of his peers and he truly loved to play the game. Perhaps he truly was so great that he found the best professional league on the planet to bore him, as he "only" finished his illustrious career with 430 goals and 599 assists for 1029 points in 1316 games. To compare, the recently anointed Hall of Famer and fellow Russian countryman and superstar Pavel Bure finished with 437/342/779 in just 702 games played. That 1993-'94 campaign saw Kovalev endure multiple suspensions for undisciplined infractions and his coach publicly suggest he be traded. What instead ensued was a quick maturation and level of production that was vital to the New York Rangers success in hoisting their first Stanley Cup in 54 years. Down the stretch in that regular season he netted an additional 15 goals to finish with 23 goals and 56 points, and in the playoffs finished 3rd on the team in scoring. As amazing as that was on a squad compiled of battle tested and proven veterans, it was his defensive play that caught the admiration of many observers in that tournament. He would later go on to Pittsburgh in a deal for Petr Nedved where he would enjoy his finest offensive season in 2000-'01 finding the back of the net 44 times and scoring 95 points playing alongside Jaromir Jagr and Mario Lemieux, and serve further stints in Montreal and Ottawa (as well as second tours of duty in New York and the 'burgh) before attempting his latest endeavor with the Panthers. And so the curtain closes on perhaps the most under appreciated NHL career of any player we have seen. We are lucky to have witnessed such magnificent brilliance for 19 seasons in North America on the world's largest stage. It has been reported that Alex may yet continue to display his talents across Europe in professional barns next season which should be of no surprise. As anyone in attendance on that December night in 1993 can attest, Mr. Kovalev simply loves to be on the ice. Summer 2013's pool of NHL free agents recently got much shallower as the Anaheim Ducks locked up their two highly coveted stars in recent weeks to 8 year max term deals. NHL Network broke the news last night that Corey Perry had signed an 8 year extension worth $69 million less than 2 weeks after the club announced the signing of captain Ryan Getzlaf to an extension of the same term and $66 million respectively. The both carry cap hits of over 8 million. In addition to remaining the cornerstones of the Orange County club they helped capture the 2007 Stanley Cup, both players maximize their compensation going forward by re-upping with their current club with the 8 year term, a stipulation under the new CBA. The Ducks currently sit second in the west with a record of 21-3-4 and have lost only 3 games in the month of March. I'll save the debate on if staging outdoor regular season contests in excess of the famed money machine that the Winter Classic has become would water down the allure of such events because, as was reported recently, such ideas are being bantered about in league offices and it boils down to one thing: green paper with pictures of dead presidents. And lots of it. 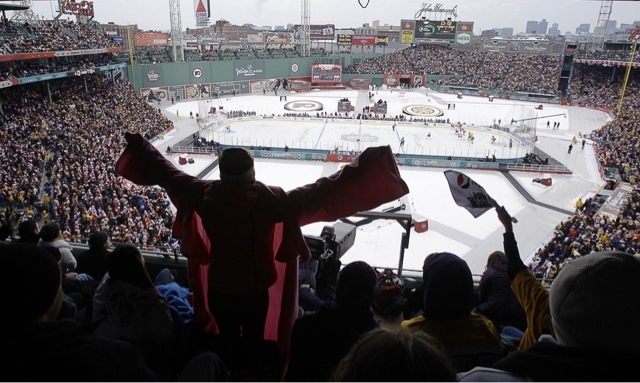 Outdoor hockey is an event that celebrates the game in its purest form while capitalizing on it in grand fashion, which is certainly ok especially if you are a league looking to recoup expenses lost due to yet another foolish lockout. If you build it, they will come, and oh will they. Fans will flock in droves to wherever these events can be staged just as they have for each of the predecessor matches, and so as they have to arenas once Gary Bettman and Donald Fehr settled their differences and in turn also called your bluff on potential boycotts. With the re-institution of the 4 division format the league will align to next season, the bread and butter of the schedule will focus on divisional rivalries, and a division championship will again be a significant achievement as such is crowned after the first two playoff rounds. With The Fourth Period's report indicating that additional outdoor games are being explored at venues such as Yankee Stadium (NHL execs have long wished to exploit this venue for such an event) in New York and Dodger Stadium in LA, one may link additional braving-the-elements-contests to the newly minted regional-centeric alignment. Next year's Winter Classic that was to be this year at Michigan's Big House features Detroit vs Toronto, whom will be divisional rivals under realignment. If speculation holds, we can expect regional match-ups in the corresponding match-ups Its a safe bet to assume the Rangers calling Yankee Stadium their home field and the recent Cup Champ Kings doing the same in the home of the Dodgers. The visiting teams lends itself to further speculation; could King Henrik face off against the heated metropolitan rival Devils or Islanders? or does Bettman and Co. feel having NHL poster boy Sid Crosby in yet another outdoor match drives national interest further? Do the Kings take on the currently red-hot Ducks to further that natural rivalry or do they face the bay area Sharks? A third installment of the Canadian-centeric Heritage Classic is said to be in play as well, this time perhaps in Vancouver or yet again in Edmonton. If this holds true it flies in the face of divisional outdoor mach-ups as both cities are to be in the league's western most division along with LA. Perhaps the Kings take on a team from the yet to be dubbed central division such as Chicago or Dallas? It will be of much interest to follow the league's movements on this as it develops into the summer. Generally announcements on outdoor events come to light mid summer, so we could receive more info around the same time as free agency. Hockey Boss was derived from a local hockey pro shop with the thought in mind to be able to offer our broad selection of equipment to more than just our loyal in-store shoppers. Operating out of our 20,000 sq ft warehouse in New Jersey, the Boss is able to distribute to the east coast’s growing number of hockey players quicker and at lower shipping costs than most competitors. We are extremely competitive in price and delivery for our nationwide customers and are improving daily. Trust the Boss to get you the highest quality hockey equipment at the most affordable prices.